Proponents of the gene-duplication hypothesis of evolution argue that a mutation can cause the duplication of a gene that allows one copy of the gene to mutate and evolve to perform a novel function, while allowing the other copy of the gene to continue to perform the original gene’s function. Gene duplication is now widely believed by Darwinists to be the main source of all new genes. A review of the evidence shows that there are numerous problems and contradictions in this theory and the empirical evidence indicates that gene duplication has a role in variation within kinds but not in evolution. Darwinists therefore have nothing more to go on than to depend heavily upon extrapolations from gene similarities—a circular argument founded upon the assumption of evolution, and yet another example of evolutionary story telling. 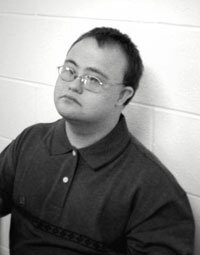 The adverse effects of gene duplication, such as Down’s syndrome, are well known. Although the methodology is available, evidence of functionally useful genes as a result of duplication is yet to be documented. Evolution by gene duplication is a form of exaptation.12-14 Exaptation is the putative evolutionary process by which a structure that evolved for some other purpose is reassigned to its current role. Gene duplication does occur. For example, chromosomal recombination can result in the loss of a gene on one chromosome and the gain of an extra copy on the sister chromosome. Gene duplication can involve not only whole genes, but also parts of genes, several genes, parts of a chromosome, or even entire chromosomes. Li has noted that polyploidy (having more chromosomes than the usual diploid number) is ‘likely to cause a severe imbalance in gene product, and their chance of being incorporated into the population is small’.16 He concludes that for both vertebrates and invertebrates only when single genes, or a few genes, are duplicated is the possibility to evolve new genes created. Because two genes are similar, though, does not prove that one was produced as a result of duplication. Chromosome abnormalities, such as triploidy, are usually harmful in most animals, especially higher animals. Conversely, polyploidy in plants is very common and can, in many circumstances, benefit the plant, although few researchers argue that it plays a significant role in large scale evolution.19 Some evidence exists that polyploidy is a mechanism that produces variety within created kinds, similar to the effects of crossing over that occurs during meiosis. The specific effects of polyploidy depend on the environment and the plant. Polyploidy increases cell size, causing a reduction of the surface-to-volume ratio that can reduce the rate of some cell functions, including metabolism and growth. Conversely, some polyploids are more tolerant to drought and nutrient-deficient soils. In addition, some polyploids have greater resistance to pests and pathogens.20 However, in all of these cases, a fitness cost exists, meaning that in many environments polyploidy is a disadvantage. Much more research is needed for a proper understanding of plant polyploidy in order to determine under what specific conditions it is harmful and, conversely, under what specific conditions it is beneficial. As its biological function seems to be primarily to produce variety, it is not normally lethal (or even regularly lethal), as are most examples of animal polyploidy. Statistical evaluation of the predictions of the gene duplication theory does not appear to be favourable to it. For example, the theory predicts a positive correlation between organismal complexity and gene number, genome size and/or chromosome number. All of these predictions are contradicted by the evidence. In terms of chromosome number, the descending rank order of diploid numbers for a selection of animals is as follows: Cambarus clarkii (a crayfish) 200, dog 78, chicken 78, human 46, Xenopus laevis (South African clawed frog) 36, Drosophila melanogaster (fruit fly) 8, Myrmecia pilosula (an ant) 2. These results do not fit the predictions of the gene duplication theory—perhaps they imply that flying on your own wings or in airplanes (fruit fly and human, respectively) needs less chromosomal input than lying around in swamps (frog and crayfish, respectively). Another statistical challenge has been noted by evolutionist genetics professor Steve Jones who concluded that an inverse relationship exists between the amount of DNA on one hand, and, on the other, both lethargic lifestyles and the speed at which organisms can evolve: the more DNA, the slower it is able to evolve. It takes a great deal of energy and resources to duplicate DNA, and the less of it an organism has, the faster it can reproduce (and the more efficient it is). Jones notes that ‘all weeds have small genomes, while more established plants are packed with DNA and can take a month to make a single egg cell’.26 Another example Jones cites is lungfish, which ‘are stuffed with DNA (most of it with no apparent function) and their evolution has stalled altogether … bacteria are speedy and have no excess genetic material, while salamanders, torpid as they are, are filled with DNA’.26 In his view, natural selection selects against gene duplication. 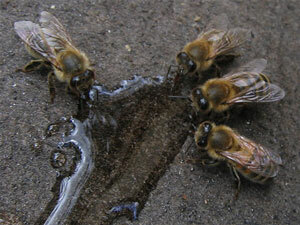 Male bees have a haploid number of chromosomes whereas female bees are diploid. This however, does not cause females to evolve faster, as predicted by gene duplication theory. An important alternative to the Darwinists exclusive focus on genes is emerging in ‘evo-devo’ (evolutionary development theory). They claim (with a great deal of experimental evidence behind them) that the content of the genome is not the primary determinant of identity; it is the epigenetic control system that decides how the genes are used. 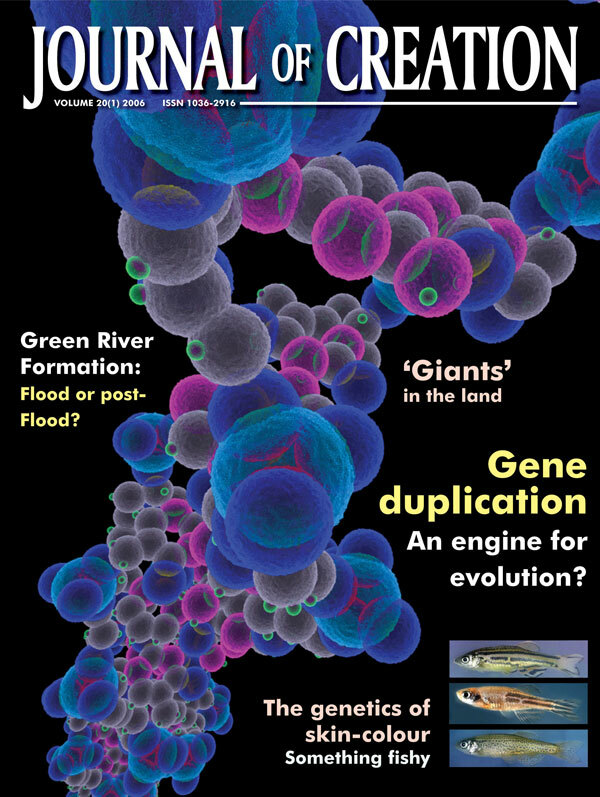 ‘A surprisingly small number of genes—“tool kit genes”—are the primary components for building all animals, and these genes emerged before … the Cambrian explosion [emphasis added].’27 That means the essential genes have not changed significantly over time, contradicting the central claim of neo-Darwinism. The function of these genes can be compared to keys on a piano keyboard. The kind of music that is played (i.e. whether an embryo turns into a man or a mouse) is determined, not so much by the keys themselves, but by the player who strikes the keys and by the musical score that the player follows. If this is true, then arguments about gene duplication are irrelevant because ‘evolution’ occurs somewhere else (i.e. in the ‘playing’ and in ‘musical score’). Although the globin gene family is the most commonly sited example of ‘evolution by gene duplication’, there is no evidence to support this. Moreover, it is known that the various globin variants of hemoglobin are designed to meet the differing demands for oxygen metabolism during the various stages of embryological, fetal and neonatal (and later) development. Another putative mechanism is partial duplication, which results in a gene mosaic. This condition, called a patchwork gene, often consists of several different regions that are similar to other genes. Likewise, because of this similarity it is assumed that the gene segments haphazardly combined until a rare combination occurred that was beneficial, so that this gene was selected. The most common hypothetical example is the LDL (Low-Density Lipoprotein) receptor. This relationship is hypothesized because part of the LDL receptor is similar to the epidermal growth factor hormone. Some theorize that this part of the gene evolved from a partial duplication of the epidermal growth factor gene. But how was the function of the LDL receptor maintained until this gene evolved? Without functional LDL receptors, a cell cannot effectively take in lipids, causing not only a supply deficiency in the cell, but also excess LDL in the blood, resulting in vascular problems from stroke, to embolisms, to heart disease. An example is hypercholesterolemia, a disease caused by defective lipid receptors. The victims often have strokes and heart attacks before their teens, even if on a low-fat diet. A group of genes that is closely related and theorized to have evolved by successive duplication is called a gene family, and an even larger group of genes that has structural similarities is titled a gene superfamily. No evidence of ancient genes exists to empirically document the theorized evolution of any gene family or superfamily. Instead, a gene ‘family’ is determined merely by making comparisons among existing genes, noting those that are similar. But any arbitrary collection of items—words, ideas, or physical objects—can be grouped together to form ‘families’ and ‘super families’, and no exception exists for genes. An automobile and a lawnmower, for example, both belong to the ‘four-wheeled machine family’ but this does not necessarily imply common ancestry. We are therefore not compelled to believe that because some genes have similar components that they evolved from a common ancestor. The first genes speculated to have evolved as a result of gene duplication were therefore the alpha and beta hemoglobin chains used to carry oxygen in erythrocytes.9 The globin gene family is now the most commonly cited example of evolution by gene duplication. Myoglobin, a monomeric protein found mainly in muscle tissue where it serves as an intracellular storage site for oxygen, is hypothesized to have evolved into the tetrameric hemoglobin. Hemoglobin consists of two dimers, each one containing an alpha globin and a non-alpha globin. The ancestral non-alpha globin, called beta globin, supposedly gave rise to modern gamma, delta, and epsilon globin genes, and duplication of the alpha globin produced the epsilon and zeta globin genes. These globin variants are all used during different stages of embryological, fetal and neonatal (and later) development. The alpha, zeta and epsilon globin chains are produced in the early embryo and, during about the third month, the latter chains are replaced by the gamma chain and then later by the adult beta or delta chains at birth. But all of this supposed evolution is based on nothing more than speculation. In real life, the multiple uses of globin molecules in oxygen metabolism is no more an indicator of blind replication than is the multiple use of cogwheels in a clockwork mechanism. Just as each cogwheel is specifically structured and located to do a particular job, is functionally integrated with its fellows to optimally do that job, and is precisely regulated to do it at the right time, so are the globin molecules designed to meet the differing demands for oxygen metabolism during the development of the organism. The site of hemoglobin synthesis also changes from yolk sac to liver to bone marrow during development, so differing environments and transport systems are also involved. Disruption to hemoglobin synthesis leads to a wide range of diseases, and neo-Darwinists have been unable to explain how development could have proceeded successfully before the complex system was all in place. Another study by Behe and Snoke30 evaluated gene duplication by using mathematical modeling and published gene-duplication data. Their model assumes the simplest route to produce a new gene function: a duplicated gene that is free from purifying selection and subject to point mutation, and the minimum number of biologically relevant modifications required to create a novel function. Because the minimum number of changes necessary for most new gene functions is greater than one altered amino acid, and the number of changes needed in DNA for each altered amino acid varies between one and three, definitive estimates are difficult to obtain. Nonetheless, a reasonable estimate can be obtained in attempting to evaluate the validity of the duplication-mutation model. Behe and Snoke concluded that, even given liberal estimates, fixation of features requiring changes in multiple residues requires both population sizes and numbers of generations so large that they ‘seem prohibitive’. They concluded that gene duplication, coupled with point mutations, does not appear to be a promising mechanism for producing new proteins that require more than a single point mutation. Although many, if not most, genes are assumed to have arisen by gene duplication, a clear lack of evidence exists for gene duplication as the source of specific genes. Gene duplication is a supposed method of exaptation—the takeover of an existing function to serve another purpose. Gould believed exaptation was so important that ‘the defining notion of quirky functional shift [i.e. exaptation] might almost be equated with evolutionary change itself … in textbook parlance, “the origin of evolutionary novelites”’.38 But this kind of argument is fundamentally flawed. If all evolutionary novelties arise from something else that was itself exapted from something else, then an indefinite regress results. The problem with an indefinite regress is that explanation ‘A’ depends on an earlier explanation ‘B’ that you have not given, and explanation ‘B’ itself depends upon an earlier explanation ‘C’ that you likewise have not given. While you may appear to be explaining something, there is no actual explanatory content—it is no explanation at all. Multiple information conservation mechanisms are at work in all living organisms, ranging from natural selection eliminating the unfit, through various reproductive and chromosomal controls, to error correction routines and DNA repair mechanisms, including (it appears) restoration from non-DNA sources. As a result, many, if not most, genes are ‘evolutionarily conserved’, meaning that they are very similar in many unrelated organisms, both ‘simple’ and complex, modern and ancient. Many genes in the assumed earliest forms of life are very similar to those in the most advanced forms. These facts argue strongly against gene duplication as a mechanism of evolution, because they indicate that most genes were optimally functional from the beginning. It also is clear that the evidence for gene duplication at present is totally inferential, and not empirical or experimental. Chromosome duplication can produce useable variety—but only within what are most likely created kinds—in plants and invertebrates, and single gene duplication appears to do likewise in rare cases in vertebrates, but otherwise gene duplication generally causes disease and deformity. The existing experimental evidence does not support gene duplication as a source of new genes for at least populations of fewer than one billion.30 According to Hughes, ‘Everything we’ve looked at [fails to] support the hypothesis.’39 Darwinists promote gene duplication as an important means of evolution, not because of the evidence, but because they see no other viable mechanism to produce the required large number of new functional genes to turn a microbe into a microbiologist. In other words, evolution by gene-duplication is yet another example of just-so story-telling. Pennisi, E., Genome duplications: the stuff of evolution? Science 294:2458–2460, 2001. Return to Text. Gallardo, M.H., Kausel, G., Jimenez, A., Bacquet, C., Gonzalez, C., Figueroa, J., Kohler, N. and Ojeda, R., Whole-genome duplications in South American desert rodents (Octodontidae), Biological J. Linnean Society 82:443–451, 2004. Return to Text. Ohta, T., Evolution by gene duplication revisited: differentiation of regulatory elements versus proteins, Genetica 118:209–216, 2003. Return to Text. Patthy, L., Molecular assembly of genes and the evolution of new functions, Genetica 118:217–231, 2003. Return to Text. Fortna, A., Young, K., MacLaren, E., Marshall, K., Hahn, G., Meltesen, Brenton, M., Hink, R., Burgers, S., Hernandez–Boussard, T., Karimpour–Fard, A., Glueck, D., McGavran, L., Berry, R., Pollack, J. and Sikela, J.M., Lineage-specific gene duplication and loss in human and great ape evolution, PloS Biology 2(7):937–954, 2004. Return to Text. Hurles, M., Gene duplication: the genomic trade in spare parts, PloS Biology 2(7):900–904, 2004. Return to Text. Shanks, N., God, the Devil, and Darwin, Oxford University Press, NY, p. 74, 2004. Return to Text. Mayr, E., What Evolution Is, Basic Books, NY, pp. 108–109, 2001. Return to Text. Li, W.-H., Molecular Evolution, Sinauer Associates, Sunderland, MA, p. 269, 1997. Return to Text. Pennisi, ref.1, p. 2458. Return to Text. Kellis, M., Birren, B.W. and Lander, E.S., Proof and evolutionary analysis of ancient genome duplication in the yeast Saccharomyces Cerevisiae, Nature 428:617–624, 2004. Return to Text. Lecharny, A., Boudet, N., Gy, I., Aubourg, S. and Kreis, M., Introns in, introns out in plant gene families: a genomic approach to the dynamics of gene structure, J. 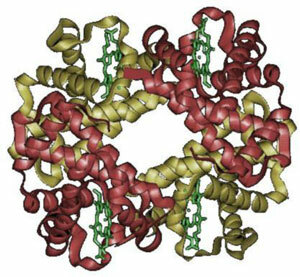 Structural and Functional Genomics 3(1–4):111–116, 2003. Return to Text. Shi, P., Zhang J., Yang, H. and Zhang Y.-P., Adaptive diversification of bitter taste receptor genes in mammalian evolution, Molecular Biology and Evolution 20(5):805–814, 2003. Return to Text. Goffeau, A., Evolutionary genomics: seeing double, Nature 430:25, 2004. Return to Text. Eakin, G.S. and Behringer, R.R., Tetraploid development in the mouse, Developmental Dynamics 228:751–766, 2003. Return to Text. Li, ref. 9, p. 270. Return to Text. Ohno, S., Evolution by Gene Duplication, Springer-Verlag, Berlin, 1970. Return to Text. Hurles, ref. 6, p. 900. Return to Text. Levin, D.A., The Role of Chromosomal Change in Plant Evolution, Oxford University Press, NY, p.134, 2002. Return to Text. Levin, ref. 19, p. 146. Return to Text. Gallardo, ref. 2, p. 444. Return to Text. Eakin, ref. 15, p. 751. Return to Text. International Human Genome Sequencing Consortium, Finishing the euchromatic sequence of the human genome, Nature 431:931–945, 2004. Return to Text. Yu J. and 97 others, A draft sequence of the rice genome (Oryza sativa L. ssp. indica), Science 296(5565):79–92, 2002. Return to Text. Williams, A., Copying confusion: does duplication of existing DNA help evolution? Creation 25(4):15, 2003. Return to Text. Jones, S., Darwin’s Ghost: The Origin of Species Updated, Random House, NY, p. 226, 2000. Return to Text. Carroll, S.B., Endless Forms Most Beautiful: The New Science of Evo Devo, WW Norton & Company, NY, jacket notes, 2005. Return to Text. Pennisi, ref. 1, p. 2459. Return to Text. Lynch, M. and Conery, J.S., The evolutionary demography of duplicate genes, J. Structural and Functional Genomics 3:35–44, 2003. Return to Text. Behe, M.J. and Snoke, D.W., Simulating evolution by gene duplication of protein features that require multiple amino acid residues, Protein Science 13:2651–2664, 2004; p. 2652. Return to Text. Cold Spring Harbor Laboratory Bulletin, Cold Spring Harbor Press, New York, 15 February 2005, p. 1. Return to Text. Zhang, J., Evolution by gene duplication: an update, Trends in Ecology and Evolution 18:292–298, 2003; p. 292. Return to Text. Trabesinger–Ruef, N., Jermann, T., Zankel, T., Durrant, B., Frank, G. and Benner, S.A., Pseudogenes in ribonuclease evolution: a source of new biomacromolecular function? Federation of European Biochemical Societies Letters 382:319–322, 1996. Return to Text. Beck, S. and Trowsdale, J., The human Major Histocompatibility Complex: lessons from the DNA sequence, Annual Review of Genomics Human Genetics 1:117–137, 2000. Return to Text. Lynch and Conery, ref. 29, p. 35. Return to Text. Standish, T., Gene duplication and protein evolution, Origins 56:36–37, 2004. Return to Text. Ketterson, E.D. and Nolan Jr, V., Adaptation, exaptation and constraint: a hormonal perspective, The American Naturalist 154:S4–S10, 1999. Return to Text. Gould, S.J., The Structure of Evolutionary Theory, Harvard University Press, Cambridge, MA, p.1234, 2002. Return to Text. Pennisi, ref. 1, p. 2460. Return to Text.